justthefood.com...the blog: Worldwide Vegan Bake Sale! This Saturday! Worldwide Vegan Bake Sale! This Saturday! 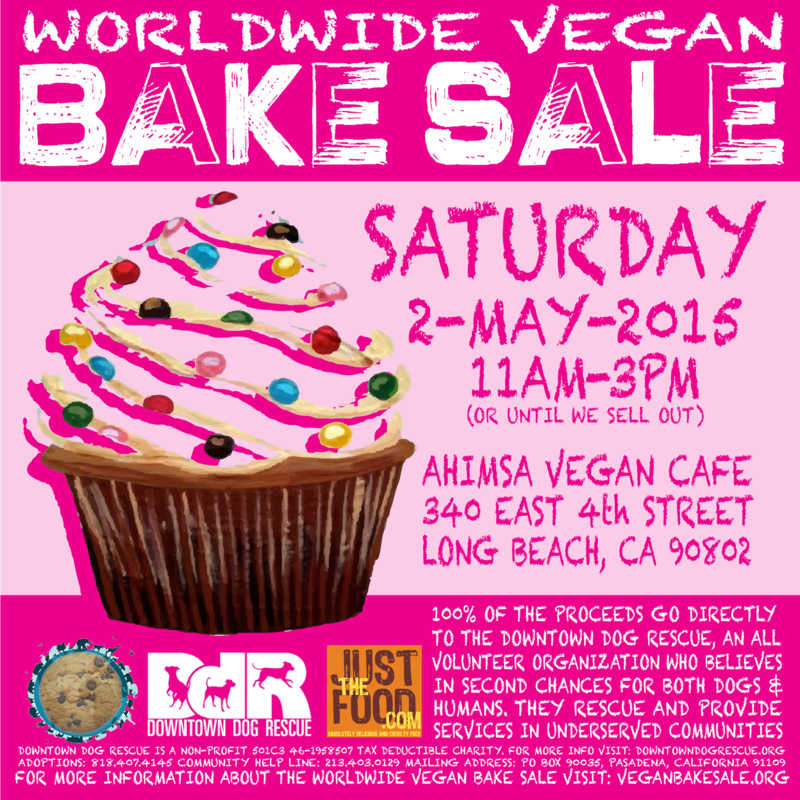 This Saturday, May 2, 2015 I will be hosting the Long Beach edition of the Worldwide Vegan Bake Sale at Ahimsa Vegan Cafe in the East Village Arts District. Special thanks to Ahimsa for allowing me to post up in front of their ALL VEGAN CAFE from 11 am to 3 pm. It's very appreciated. Make sure that if you decide to stop by, that you step inside for lunch, a sandwich or bowl to go, or a fresh pressed juice. YUM! This year is my first back in Long Beach. The last few years I have held my bake sale out in the rural community of Trabuco Canyon where I raised money for local charities like Hanaeleh Horse Rescue and Barks of Love. So I searched for a local charity near Long Beach that needed my funds and I came across the Downtown Dog Rescue by word of mouth from a coworker of my husband who does some volunteer work for them. "Downtown Dog Rescue is an all volunteer run 501C3 non-profit organization that believes in second chances for both dogs and people. We rescue dogs and provide services for low income pet owners in under served communities in Los Angeles County." I have thoroughly enjoyed reading your article. This post provides more useful information to me.I really like the information you offer in your articles..I am thankful to you for sharing this useful article. Here we have an advertisement. Thankful to you for sharing this update. I always love to watch videos like this and it is a video about dog rescue mission. It is truly inspiring. yes man, its a very useful article. i tried it on Nike Free 5.0 Flyknit running shoes my sites. its work. thank you so much! I am so happy to read this. This Nike Air Max 90 Joggesko is the kind of manual that needs to be given and not the random misinformation that's at the other blogs.